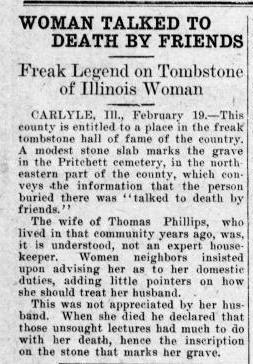 Alice, "Talked to Death By Friends"
I may never actually visit the grave of Alice Phillip (perhaps Phillips) in the Pritchett Cemetery located in Boulder Illinois, but I wanted to share her tombstone because of its unusual inscription. 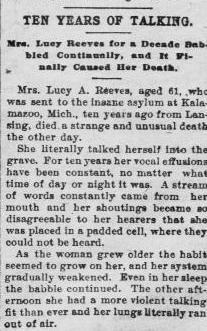 I found out about Alice’s epitaph in the article that you see to the left from The Appeal (a Minnesota paper) on April 23, 1910. A photo of the actual weathered stone as well as a different version of the story about why her husband chose that phrase can be found on Alice’s Find a Grave memorial page. There are actually a number of stories behind the tombstone and which one of them, if any, if the actual version we may never know. Over the years, the story of Alice’s marker was printed by newspapers across the country, each article offering its own spin on how she’d allegedly been talked to death. There are also variations on her surname, making it more difficult to track her down. I tried to locate her and/or her husband in census records to no avail. One article suggested that the epitaph also included her birth and death dates as Apr. 10, 1861-Nov. 15, 1909; however this is unlikely since another newspaper reported on the stone in 1891. There are two common themes among the articles surrounding Alice’s death. One is that at some point she became gravely ill and the second that her husband chose this particular inscription to express his disgust and blame towards people in the community for having contributed to her death. In one version of the tale, Alice was an invalid and was constantly pestered by townspeople on how she should go about regaining her health. She was so troubled by the constant meddling that she ended up dying from prostration. Other versions suggest that Alice’s neighbors and friends didn’t feel that she was very good at her “domestic duties” and pestered her regularly with unsolicited advice about everything from how to keep Thomas happy to how to dress and ways to make her cooking taste more delicious. 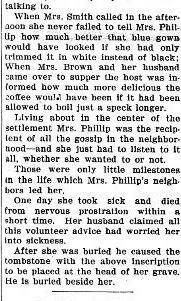 It wasn’t until after suffering through the gossip and solicitations of the community that she fell ill and died. The information on the Find A Grave link above is the only version I’ve read thus far that mentions anything about Alice’s mother being involved, but it does state that the story was based on local folklore. Of course, the entire story sounds like it’s largely based on folklore in some way, shape, or form. Prostration was used fairly frequently as a cause of death in the 19th century and generally refers to a crippling depression where often the person is confined to the bed. The exact cause of her death and the events that led to her prostration remain a mystery over a century later, but her unique epitaph serves as a grim reminder of the possible ill effects of meddling.